Could the Paleo Diet Be The Key To Long Term Health? Posted on July 10, 2014 | Comments Off on Could the Paleo Diet Be The Key To Long Term Health? When we eat foods that are consistent with our genetic ancestry, we can avoid many of the diseases associated with our modern diets. That by eliminating sugars, processed foods, and refined carbohydrates, we can effectively eliminate underlying causes of modern disease such as diabetes, obesity, insulin resistance, hypertension, and high cholesterol. This way of eating results in stable blood sugar, reduced inflammation, a reduction in stored body fat, improved sleep patterns and better overall health. Emory University research suggests that our Paleolithic (Old Stone Age) ancestors ate a balanced diet of 35% fats, 35% carbohydrates and 30% protein. For two million years or more, this diet consisted of whole foods that could be hunted, gathered, fished or foraged. Proponents of the paleo diet believe it’s the healthiest way to eat because it nutritionally supports our genetics and keeps us lean, strong and energetic. The Standard American Diet (SAD) consists of refined grains, processed foods, unhealthy fats and added sugars. Most grains, including whole grains, corn, soybeans, canola and sugar beets are now genetically modified and came into existence in the mid 90’s. Some estimates show that 75% of processed foods now contain GMO ingredients that are certainly not part of our genetic ancestry. A strict Paleo diet consists solely of whole foods such as fresh fruits, non-starchy vegetables, lean meats (preferably from free-range grass fed animals and free-roaming chickens), wild caught seafood, nuts and seeds, eggs, healthy fats such as avocado, nut oils and coconut, and raw honey. This requires avoidance of foods that did not exist at the time of our ancestors including dairy, grains, processed food, sugars, legumes, starches and alcohol. Evidence suggests good reasons to give up dietary refined carbohydrates, sugars and processed foods. The constant consumption of these foods desensitizes the body’s insulin response, leading to insulin resistance. Studies suggest that lower levels of refined carbohydrates and higher levels of protein lead to weight loss and improved metabolic responses, improved insulin sensitivity, improved blood lipids and lowered blood pressure. 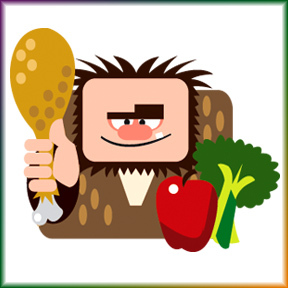 Using contemporary foods currently available in food stores, it is entirely possible to emulate the essential characteristics of a nutritious, balanced hunter-gatherer diet that mimics the food groups and types of food available during the Paleolithic Age. Despite the elimination of two major food groups (grains and dairy), the trace nutrient density remains exceptionally high. The macronutrient content of the Paleo diet (38% protein, 39% fat and 23% carbohydrate) varies considerably from current western values. Contemporary diets based on Paleolithic food groups maintains both trace and macronutrients qualities that are known to reduce the risk of a variety of chronic diseases. Although the contemporary Paleo diet provides no dietary vitamin D, hunter-gatherers would have obtained vitamin D from sunlight exposure. Other characteristics of the Paleo diet, including a high intake of antioxidants, fiber, vitamins, and phytochemicals along with low salt intake. further reduces the risk of developing chronic diseases. As a result of a mismatch between the contemporary diet and our genetically determined physiology, many diseases of civilization have emerged. The consumption of whole foods, as close to nature as possible, supports overall health. The elimination of the same forbidden foods that the Harvard Medical School recommends for the avoidance of heart disease, including sugar, processed foods, fast foods, refined and processed grains and carbohydrates. The Paleo diet is low in sodium and high in potassium, which supports vascular health and lowered blood pressure. Reduction of added refined sugars, which contribute to insulin resistance, obesity, and heart disease. The replacement of refined carbohydrates with more high nutrient dense vegetables and fruits provides necessary calcium and nutrients, while eliminating spikes in blood glucose levels. Elimination of refined grains aids in the reduction of abdominal fat, which contributes to fatty liver disease and type 2 diabetes. The addition of omega-3 fatty acids from fish and the consumption healthy saturated fats supports heart, brain and immune health. There’s no calorie counting. Just consume real whole foods that keep you satiated, reduce hunger pangs and break the addictive sugar craving cycle. PaleoMeal® by Designs for Health – PaleoMeal® is a great-tasting, nutrient-rich powdered meal supplement designed to help promote an optimal intake of protein, fats, carbohydrates, vitamins and minerals in support of overall wellness. This minimally processed product is available in either plant-derived or whey-derived protein formulas. Available in a variety of natural flavors. PaleoGreens™ Organic Powder by Designs for Health – PaleoGreens is a great tasting, unflavored greens food made with organic ingredients with the principles of wholesome Paleolithic nutrition in mind. It contains cleansing, regenerative and alkalinizing grass juices, algae, enzymes, and prebiotics, combined with high ORAC value vegetables, fruits and berries. Also available in Mint and Lemon/Lime flavored formulas. PaleoCleanse™ – PaleoCleanse contains quality macronutrients to fuel detoxification pathways. This product contains a full array of multivitamins and minerals for detoxification enzyme support, all the nutrients needed to support and balance phase I and II metabolic pathways, and high levels of antioxidant support for safe detoxification. PaleoBar™ – Available in a variety of flavors, PaleoBars are a micronutrient dense, health promoting snack/meal supplement that can be very beneficial in the implementation of a successful low-carbohydrate eating plan. Available in dairy free and whey protein formulas. This entry was posted in Home and tagged Paleo diet, PaleoBar, PaleoCleanse, PaleoGreens, PaleoMeal, Professional Supplement Center, Vitamins and supplements, www.professionalsupplementcenter.com. Bookmark the permalink.